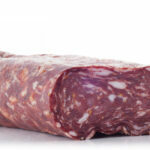 This thickly minced sopressa salami is made using the world famous methods from the Veneto region in northern Italy. The freshest cuts of pork and beef are minced and left to exhibit a balance of bright colour and coarse texture. 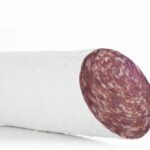 Fine aromatic spices are used to give sopressa its delicately sweet flavoured style achieved in combination with the longer drying process for these larger diameter salamis. 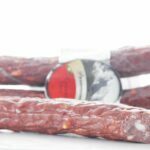 Our sopressa can be enjoyed in the mild or hot styles, fresh sliced or toasted with polenta and a side dish of cherry tomatoes, rocket and black olives. Prepare and serve sopressa on home made pizza with a topping of rich mozzarella and pine nuts. We are very proud to announce that Sopressa Hot won a Silver medal at the 2016 Australian Food Awards ! 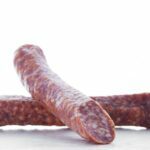 Ingredients: Pork Meat (95%), Salt, Skim Milk Powder, Lactose, Spices, Dextrose, Maltodextrin, Sugar, Red Wine (contains milk derivatives), Antioxidant (316), Dehydrated Vegetable, Sodium Nitrite (250), Culture, Natural Colour.